The App provides multiple options for assigning cases automatically on creation (from email-to-case). You can either hand pick support agents who are experts in their domain and assign them cases automatically or configure smart rules to assign cases when they meet the filters set by you. You can select a default user or team in the configuration section. All cases created (email-to-case) from a particular queue will be assigned to this selected user/queue. The Account / Contact entity has a field called “Preferred User”. This field allows selecting a CRM user as a preferred user. If this option is enabled in Zap email-to-case settings, then the app would dynamically pick the preferred user from the account/contact of the Case.Customer and assign the case ownership. This can be useful if you have dedicated support users for particular Customers. Smart Rule based on matching keywords: Here, you can create a rule with certain keywords, which if present in incoming email body or subject will result in auto-assignment of the created case to a particular CRM user or team. 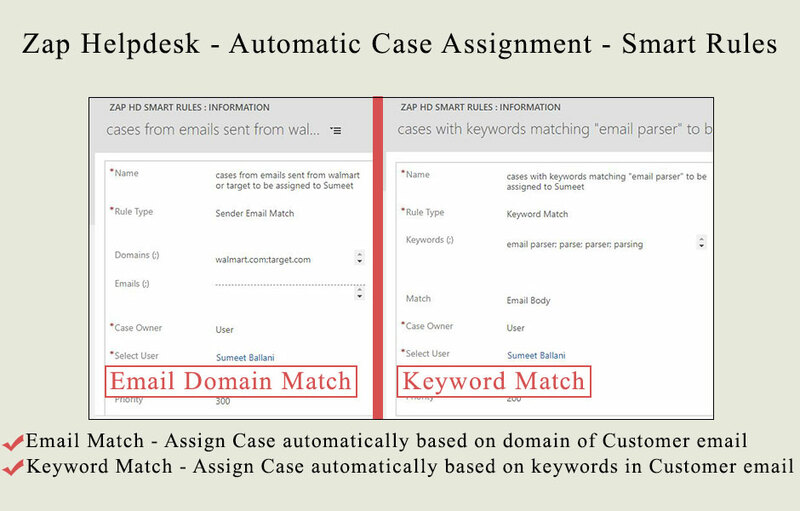 Example: if incoming email subject / body contains keywords like “helpdesk”, “email to case” then automatically assign the case to user Sam Cary. Smart Rule based on sender email address: If you have certain group of customers who have a preferred user for providing support then you can configure that using a smart rule. Example: If the sender email address domain is “Walmart.com” then automatically assign the case to user Sam Cary. You can create multiple smart rules. The rules have a field called priority in which you can enter a numeric value. The rules will be executed based on their priority number ordered by highest number to lowest. Stop manually assigning cases to agents and let Round Robin evenly assign them for you. Here cases are assigned one-after-another to users that have been added in the User queue. You can add / remove users from the User queue as and when needed. Please note that presently round-robin is supported only for on-premise environments. 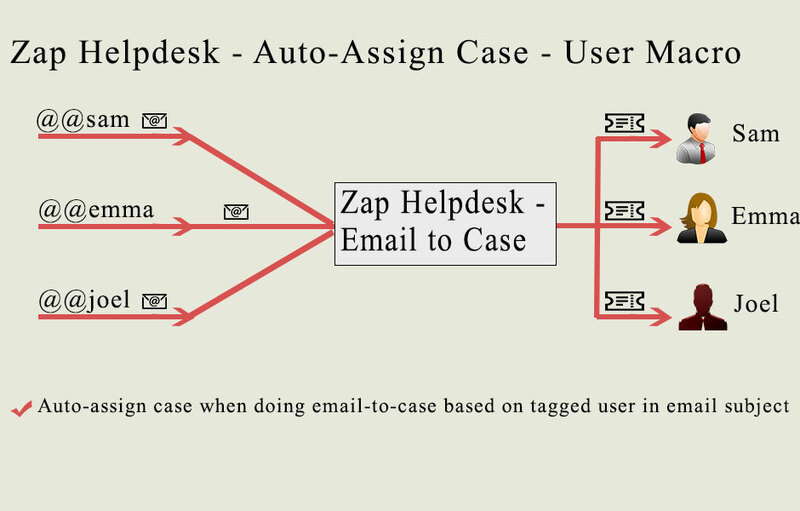 The above case assignment techniques can be configured in Zap Helpdesk- Email to Case Settings section by the administrator. There is one more technique for case assignment…difference being that this one can be specified by Customer. This is called as “Option 5:Case assignment based on User-Macro“. Explanation: Case can be automatically assigned to a user based on user-macro as specified in email subject. When a new case is created using Zap Email-to-Case App, then the owner would automatically be assigned to user Sam Cary by extracting the user macro details from email subject. 1. “@@” is the marker which tells the app that a user macro has been added in email subject. This marker text : “@@” can be changed in the configuration section if needed. a. Direct match with user email. Here “=” query is used. Please note that case assignment based on user-macro (which is normally specified by Customer), over-rides all other case assignment techniques. The above case assignment techniques will help you automate your case assignment process, reduce clutter and have your cases actioned faster! If you follow a different process for assigning cases and would like to automate it then feel free to reach out to our support team.